I found this in the current issue of Rolling Stone, in an interview with comedian Louis C. K.
“When you sit down to write “Louie,” what are your work habits? SO WISE! Find ways of making it easier for you to focus on important work by making your distractions just a bit less convenient. 1) Go places where the Internet is not available. 2) Hide your smart phone or put it in another room. 4) Put a note on your office door saying you’ll be back later and giving an approximate time (even if you’re hiding in your office. 5) Check-in with people who are likely to have a true emergency and make sure they know how to find you in said emergency. The allure of the Internet is powerful and ever-present. Try to find ways to lessen its force when you need to. 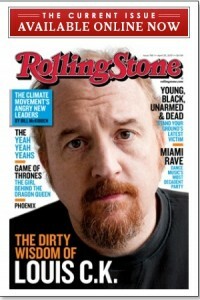 One Response to The Creative Wisdom of Louis C. K.
Thanks for sharing your thoughts on Children and Media.